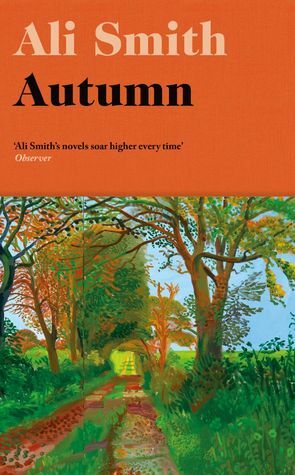 Autumn is the first of Ali Smith’s books I’ve read and at first I wasn’t sure what to make of it. The blurb attracted me – it describes it as ‘a breathtakingly inventive new novel, a meditation on a world growing ever more bordered and exclusive, on what richness and worth are, on what harvest means.‘ I didn’t find it ‘breathtaking’ but I did enjoy it. I liked the beginning which begins with a stream of consciousness as Daniel Gluck, a very old man, ponders his life and his approaching death. The main focus of Autumn is the relationship between Daniel and Elisabeth Demand who first met when Elisabeth was a child and moved into the house next door to Daniel’s. We see their friendship at various stages in their lives throughout the book. As I expected from the blurb Autumn is not a straightforward story, so whilst I wanted to know more about the Daniel and Elisabeth story I was quite happy to diverge from their story through the different sections about a variety of different themes from death, aging, love and of course autumn. I liked the wordplay and references to many other books from Dickens to Shakespeare, the details about Christine Keeler and the Profumo Affair, the life, work and death of the pop artist Pauline Boty, and the accurate and amusing accounts of the frustrations of everyday life such as those describing Elisabeth’s attempts to renew her passport. It’s both poignant and cutting in its look at modern life, how we got to where we are, and the mood of the country post-Brexit (that word is never mentioned) – the confusion and the misery and rejoicing, the insanity, and the division. It’s a remarkable book. Autumn is the first installment in Ali Smith’s novel quartet Seasonal: four standalone books, separate yet interconnected and cyclical (as the seasons are), exploring what time is, how we experience it, and the recurring markers in the shapes our lives take and in our ways with narrative. Ali Smith was born in Inverness in 1962. She is the author of Free Love and Other Stories, Like, Other Stories and Other Stories, Hotel World, The Whole Story and Other Stories, The Accidental, Girl Meets Boy, The First Person and Other Stories, There but for the, Artful, How to be both, and Public library and other stories. Hotel World was shortlisted for the Booker Prize and the Orange Prize and The Accidental was shortlisted for the Man Booker and the Orange Prize. How to be both won the Baileys Women’s Prize for Fiction, the Goldsmiths Prize and the Costa Novel Award and was shortlisted for the Man Booker and the Folio Prize. Ali Smith lives in Cambridge. This one does sound interesting, Margaret. For me, anyway, stream of consciousness has to be done very well for it to be effective, but it sounds as though it was here. Margot, I think it is well done ‘“ it’s very effective in capturing the atmosphere post-Brexit for example. I thought perhaps I’d read this, but I have not. It does sound like a pleasant read. Thank You for your thoughts. Your review has me intrigued, Margaret. I like the concept you describe. One for the tbr list! Sandra, I found it quite a difficult book to write about! It’s quite moving. I hope you enjoy it when you do read it.